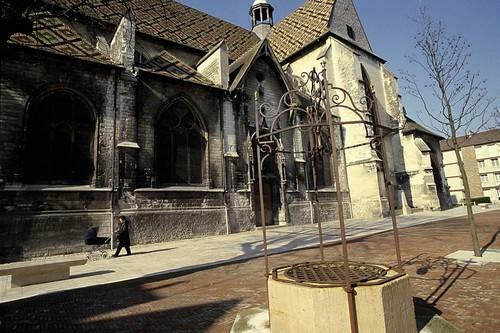 A Saint-Jean-l'Evangéliste church was located here in the 9th century. Louis le Bègue (Louis the Stammerer or Louis II) was allegedly crowned King of France here by Pope John VII. Destroyed around 889-892 by Norman pillagers, it was probably rebuilt in wood like many buildings of the time. 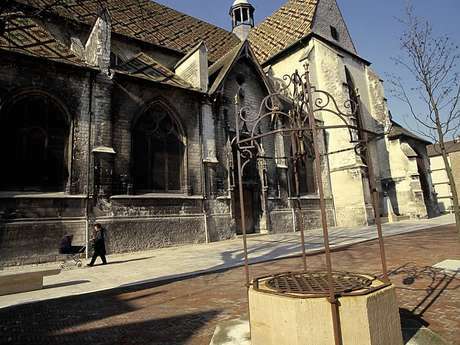 In 1188, the neighbourhood was ravaged by fire and reduced to ashes, but the lucrative foires de Champagne helped to revive the city and the church then took the name of Saint-Jean-au-Marché. 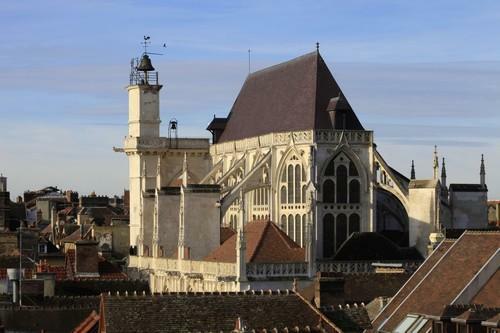 In the 13th and 14th centuries, the church was totally rebuilt, this time in stone, as we see it today, but the choir and the transept, damaged by the great fire of Troyes in 1524, were rebuilt at the start of the 16th century. On the exterior, the church was flanked by small stalls, or small houses, which were demolished at the start of the 20th century. The steeple of the Saint-Jean-au-Marché church, located at the southwest corner of the building, collapsed in 1911, and was removed along with the west façade during the demolition of the stalls. 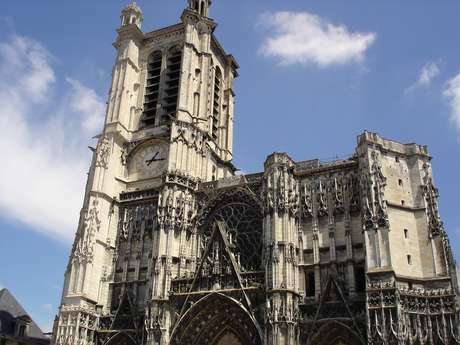 Its structure was wood and contained the bells that have been moved to the northern and southern sides of the building, which were only slightly damaged during the accident. 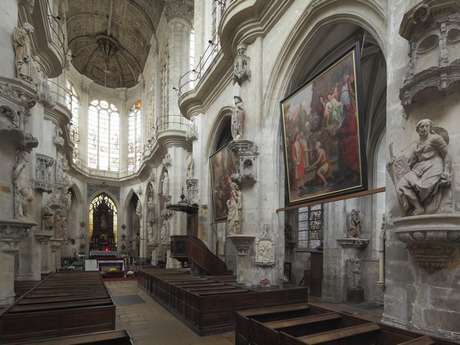 In the interior, the flat apse has an Italian-style monumental altarpiece designed in 1667 by the Parisian architect Noblet and decorated with a painting by the Troyes painter Pierre Mignard (17th century). The 32 stalls are probably from the former Notre-Dame-aux-Nonnains abbey, closed down at the Revolution (current site of the préfecture). The nave and the aisles, with pillars, decorated capitals and sculpted keystones, have wide Gothic bays. 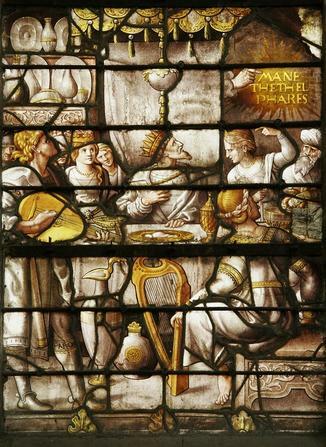 The stained glass windows were made during the Beau XVIe s. troyen. In the third bay the Judgement of Salomon (1511) is admirable and curious visitors will not overlook the Circumcision of Christ, the Martyrdom of Saint Agatha (with her blissful smile) and the Crowning of the Virgin, a stained glass window from circa 1495, all of which are located in the bays along the southern aisle. 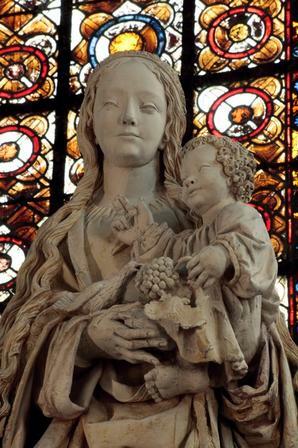 The church also contains beautiful sculptures from the Troyes school, most of which from before the 1524 fire,including a stained glass window circa 1495, in addition to beautiful sculptures also from the Troyes school : a Pietà, La Visitation of Flemish inspiration, and La Déploration. The tabernacle was decorated by François Girardon (1691). 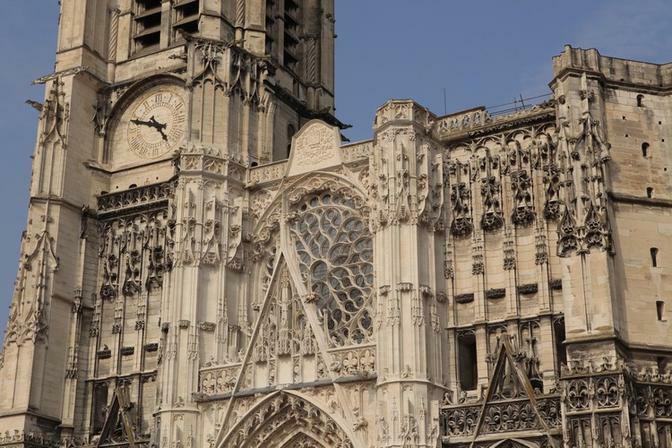 In June 1420, the church was the venue of the marriage of Henry V, King of England, and Catherine of France. This marriage ratified the disinheritance of the future Charles VII, because at the death of Charles VI and Isabeau of Bavaria, the kingdom of France was to go to the King of England. 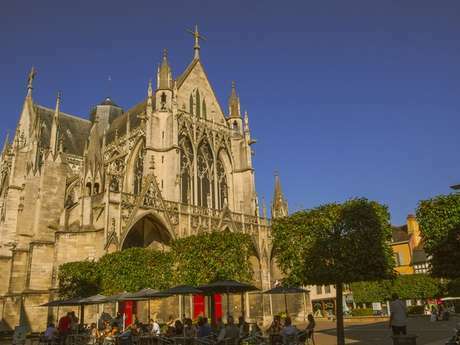 t was in all likelihood the bishop Saint Loup who had the area's first cathedral built in the 5th century, in the southeast corner of the castrum (fort). 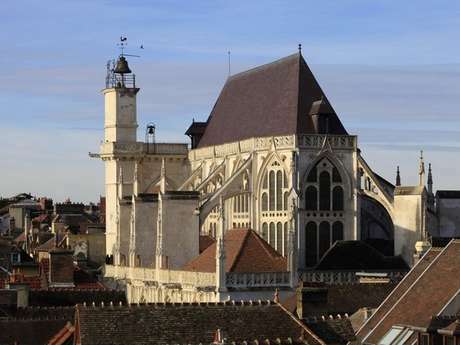 It was nearly totally destroyed in 890 when the Normans torched Troyes. 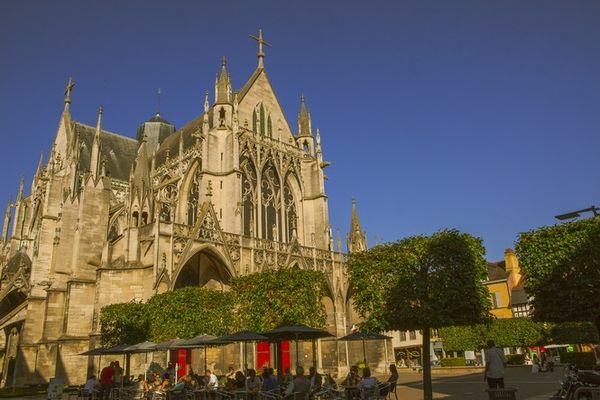 At the end of the 10th century, after a long and troubled period, Milon, the 44th bishop of Troyes, rebuilt the cathedral in the Roman style. 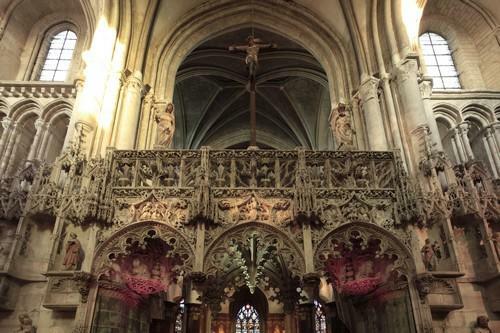 But in 1188, another fire ravaged a large part of the city and the cathedral, the remains of which are now located under the present one, was also seriously damaged. The cathedral houses a remarkable treasure, established in 1204 when Constantinople was sacked by the Crusaders. 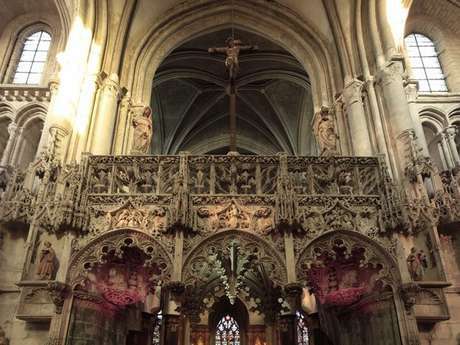 It includes an exceptional set of reliquaries, including that of Saint Bernard de Clairvaux, restored by Viollet le Duc, relics, Limousine enamels and other items of silver, including a Byzantine chest made of crimson-tinted ivory (11th century), the purses of the Counts of Champagne (13th - 14th century), enamels from the reliquary of Saint Loup (16th century), etc.